If you're looking for a fun, kinda-noirish movie with a great sense of humor and a bit of sexiness, action and character, you can do a lot worse than His Kind of Woman (1951). Starring Robert Mitchum, Jane Russell and a terrifically camp-tastic Vincent Price - the movie also features a few other notables. Charles McGraw, Raymond Burr, Jim Backus and Marjorie Reynolds also show up as various antagonists. Mitchum plays a small-time hood who is given a wad of cash and sent to a really nice Mexican resort where he's supposed to just wait for further instruction, no matter how long it takes. 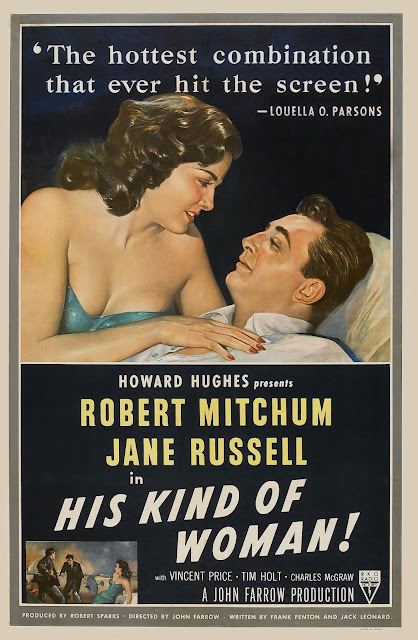 En route he meets Jane Russell, a society gal-turned-chanteuse, who - as would happen - draws Mitchum's eye. Russell is there to meet up with her actor boyfriend, Price. For a bit there's a tad of Casablanca as Mitchum wanders around trying to figure out who is who and what's going on and a few colorful characters drift in and out of the scenes. I don't want to spoil the plot, but it is.... goofy. But it's fun. And Russell is... well, there's a reason we're still pondering Russell seventy years after the fact. Weirdly, I didn't really remember the ending of the movie which is insane. Muller's story about the making of the film explained a ton (Howard Hughes, y'all), but it does make for a crazy series of events that doesn't really match the first half, tonally, but does match up narratively. Give it a shot! It's a hoot and Vincent Price is hysterical.